As the number of cyclists on our roads increases, cycling accidents are sadly also on the rise. If you have been injured while riding a bicycle in Scotland, speak to the personal injury solicitors at Thompsons. We can help you receive the cycling accident compensation you deserve. Can I make a cycling accident claim? If you are a cyclist and have suffered injury in a collision with a car, motorbike, HGV, bus, tram or other vehicle, you may be eligible to claim compensation for your injuries if it can be proven that the incident was in some way the responsibility of another party. You should also remember that your claim will be best supported by medical records, witness statements, police reports or other available evidence, so collect everything you can and let your solicitor know. The claim will need to be made within three years of the date of the accident occurring, although there are certain exceptions to the three-year time limit (please see below). The first thing you need to do is to contact an experienced personal injury lawyer who is able to carefully assess your claim and to request all the relevant details and evidence required in order to progress. The team at Thompsons has many years of experience in this field and works for claimants only, never the insurance companies. I live outside of Scotland, can I claim? There are three different legal jurisdictions in the UK: Scotland, England and Northern Ireland. If you suffered your accident in Scotland, even as a visitor, tourist, overseas worker or foreign student, you should use a Scottish personal injury lawyer to claim under Scottish law. In the vast majority of cycling accident claims, compensation is paid by the insurer of the party deemed liable for the accident – this could be a car insurance company, a public authority or the insurance representative of a business or public transportation company. In the event that you are making a claim for a hit and run incident or an accident involving an uninsured driver, the compensation will likely be paid by the Motor Insurers' Bureau. Is it possible to claim on behalf of a child or other vulnerable person? There are processes in place that allow the family or "litigation friends" of those under 18 to claim compensation for their cycling accident injuries. The same applies if you are looking to claim for someone who lacks mental capacity; this is particularly pertinent in the event of a cycling accident brain injury claim. Scottish law lays down a limit of three years. If the cycling accident claim is not commenced within this period the case will likely be time-barred. There are exceptions, however. For example, if you suffered injury before reaching 16 years of age and did not have a claim made on your behalf, the three-year time limits begins three years from the date on which you turned 16. You should look to provide your personal injury lawyer with any witness statements, medical records, police reports, photographs, contact details or receipts that relate to your accident and injuries. The amount of compensation will depend on the extent and severity of your injuries, your degree of liability and the other unique circumstances of your case. Compensation amounts vary from more than £300,000 for the most severe head injuries to around £500 for the mildest back or shoulder injuries. General damages, or solatium as it is properly called in Scotland, are another component of compensation to consider. Solatium provides a monetary recognition of your pain and suffering. It will also account for the limitations your injuries are likely to impose on the sorts of activities and quality of life you enjoyed before your accident. These may include such things as your sporting activities, your hobbies and your household chores. There are a variety of funding options available to Thompsons' personal injury clients. 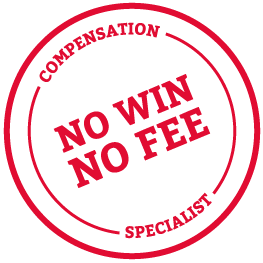 However, it is worth bearing in mind that we offer No Win No Fee funding. This means that unless you win your case, you can rest assured you will not have to pay to fund your claim in any way. Why should I trust Thompsons' with my claim? Thompsons' is one of the most well-respected personal injury firms in the country. Its lawyers have successfully helped thousands of people recover compensation for their personal injuries. In practice this means that we secure around £1 million every week for our clients and win around 90% of the cases we take on. Over the years Thompsons has won numerous awards for our litigation work and for individuals who have shown particular excellence in their fields. Call our team today tp discuss your case, or fill in one of online forms so we can call you back. There will be no obligation to proceed with a claim and there are never any upfront charges.